The Inquiry into the Civic Role of Arts Organisations is at an exciting stage. We have finished Phase One of our work, which was largely a research stage. Phase One’s report Rethinking Relationships described how arts organisations demonstrate their civic role, highlighted inspiring examples, surveyed arts organisations and interviewed key influencers. We are moving into Phase Two, and are looking for the right person to drive it forward. Working with colleagues in the UK Branch’s programmes and communications teams, a part time (4 days a week) fixed term (one year) position is being offered. We expect the candidate to be in post for the start of 2019. Click here for a job description and information on how to apply. 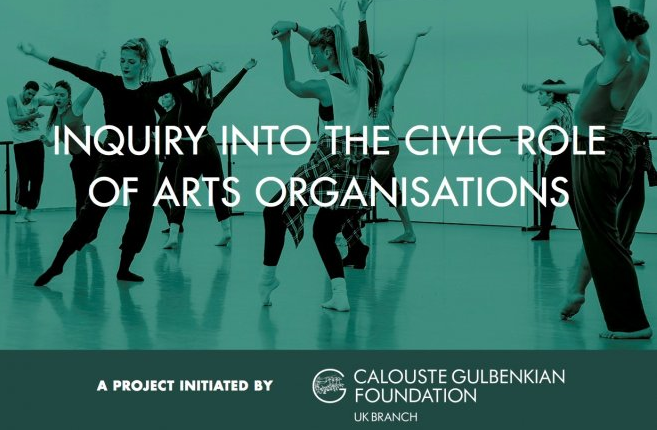 Please email civicrolearts@gulbenkian.org.uk if you have any questions.